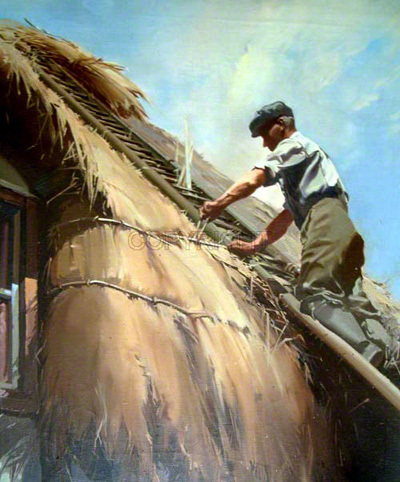 This is an image of a large oil painting by the artist showing the thatching of Dean Cottage, Vernham Dean near Andover in the year 1948. Claude Buckle lived in the cottage from 1947 till his death in 1973. He painted in a studio, a converted thatched barn, in the grounds of the cottage. The village contained a number of traditional Hampshire thatched cottages and thatching was and still is a large industry here. An example of an oil painting to illustrate the superb quality and realism in the artwork of Claude Buckle. Created in 1948.